You are trying hard to run your business and keep your patients happy but you are still struggling to get it right. Do you hear other dentists saying the same thing to you? Dentists have no time to do dentistry, run their business and keep everyone happy! Dentists have no time to do everything they want to do. This is a problem I can relate to as my husband and I also found this very difficult when we were running our dental practice. There just wasn’t enough hours in the day to be able to do dentistry and make sure our business is working well. We tried to everything and soon worked out that this was not working for us. We were juggling balls in the air and playing a great game of smoke and mirrors. We finally got smart and brought professionals in to help us in our business. Our success started once we worked out that there were a whole lot of people who knew more than us and they were able to help us get the results we were so wanting. If you want to take your business to that high level then letting people help you is the answer. Now this does not mean that you hand it all over to someone else and don’t have any control. It means you are now getting great advise to be able to make the best choices for your business. Your business is your practice, your team, your patients, yourself and also the people you choose to help you be better. Most people can own a business but can they run it smartly by themselves? You have invested so much time, energy and money into your business already. Make 2019 the year that you make your business grow and flourish. Find the right people to help you. Find people who have been there and done what you want to do. These are the people who will get what you want to do and help you get there. 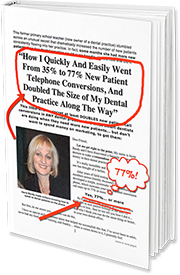 In the next two blogs,I will look at the other two problems Dentists need to work on to overcome, getting more New Patients and helping patients say yes to treatment and care.